At SBDC we strive to create a motivational and inspirational dance environment for students of all ages and abilities. Our mission is to provide an education not only in the art of dance but the development of confidence and self expression. We express the importance of technique and structure while constantly striving to evolve and adapt to current styles and artistic trends in the world of dance. With a certified, internationally renowned, and talented staff, we are committed to helping each individual student create and achieve their own dance destiny. From the recreational student to the highly competitive, pre professional; SBDC provides a training program suited to a students’ individual needs. Session Classes (45 minutes to 1 hour/week for 8-10 weeks): These are non refundable trial classes offered in two sessions throughout the year (Oct-Dec and Feb-April). They are offered in multiple disciplines taught by our certified staff based on availability and interest. They are for both children and adults. Classes take place once a week for their designated time allotment and traditionally end with a final watching week. Recreational Full Year Classes (45 minutes/week from Sept-June): These classes train once a week for the entire season and then participate in the year end recital showcase in June. They are required to purchase classroom attire and shoes as well as a costume for their recital performance. This program includes our Preschool Dance Programs as well as youth and teen programs geared towards first time or low commitment families. Recreational January-June Classes (45 minutes/week from January-June): These classes train once a week from January to June and then participate in the year end recital showcase in June. They have no mandatory classroom wear and are required to attend class in athletic clothing. The costume, including tights is included in the price of the program. Parents are required to purchase Ballet Shoes for the class. Examination Dance (45 minutes-2 hours/week from Sept-June): These classes train each week in the examination program specified by the genre. 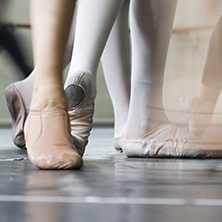 Our ballet students train in the Royal Academy of Dance (RAD) Program. Our Jazz and Tap students train in the Associated Dance Arts for Professional Teachers (ADAPT) Programs and our Acro students train in Acrobatic Arts as well as the Acrobatique Syllabus. These classes are geared towards the more serious dancer and start in the lower grades of these programs with less commitment and advance to more as students’ progress through the programs. Technique Classes (45 minutes-1 hour/week from Sept-June): These classes train each week specifically for training purposes only and do not progress into preparation for an exam, competition, or performance. They include classes such as Acro Tech for Accel Students, Progressive Ballet Training, Dance Conditioning and Turns/Kicks/Leaps where students are training only to advance themselves in the art of dance. Competitive Dance (45 minutes-1.5 hours/week): These classes range in ability levels and commitment levels and are geared towards all of our different dancers and families based on their desire to compete and how much time they are willing to designate in preparation. There are pre requisites for this program as well as recommendations made by our knowledgeable and certified staff. We offer Part Time, Part Time+ and Full Time Dance Packages for dancers who are taking multiple classes with the studio. At the time of registration we require 20% of the full tuition with gst and the registration fee which is non refundable. The remaining balance can then be broken into ten equal monthly payments from September-June via post dated cheques. Parents can also pay monthly with a credit card withdrawal agreement. There is a one time $15.00 processing fee for running a credit card each month. Registration Fees and 20% of Full Season Tuition including gst are non refundable. To withdraw from class a parent must give one month’s written notice at which point a refund of remaining tuition will be issued with the exception of the registration fee and 20% deposit. After October 31st, costume fees are non refundable. Competition Fees, Stage Rehearsal Fees and Coaching Fees are non refundable. Students withdrawing from our program after May 1st are not eligible for a refund on any costs. DO I GET TO WATCH THE WEEKLY CLASSES? Our studio facility is not set up for parents to view every class and our programs are set up for independent learning between students and teachers. SBDC will host multiple Parent Watching Weeks during a season where parents do get to come directly into our classrooms and watch their children in class. Parents will be notified of these watching weeks via our Newsletters which are sent via email and printed in carbon copy, via social media (including Facebook and Instagram), via general email and also through posting on our studio bulletin boards and windows. It is a parents’ responsibility to make sure they are informed of what is going on at the studio. No Food or Drink are permitted into our classrooms during watching weeks as well as no outdoor footwear. Parents may take pictures or videos in class but are asked to be cautious when posting on social media so as to not exploit another parent’s child. Watching weeks are broken up in order to better accommodate our facility and do not all happen at once. Session students have a watching week on the last day of their designated session ONLY. Parents and family members may come in to watch as well as take photos or videos. The above rules apply to Session parents as well. Enrollment in the SBDC full year program guarantees your student 30 classes of instruction. Included in these are dress rehearsals for the year end showcase for all students. In the event of a cancelled class due to a scheduling conflict, exams, an SBDC event, or weather, the studio will do their best within the means of the current schedule to reschedule the class and/or classes for another time. This is not a requirement of the studio as long as the 30 class criteria is met. Pre Competitive/Competitive/Accelerated classes should be prepared to have classes cancelled during competitions in which case the competition takes the place of their classroom time. There is a classroom attire handbook provided to all registered students of SBDC as well as our preferred dance store vendors. This handbook goes over in detail what is required for students to wear to class each week at the studio. By mid October each season we expect students to be adhering to the standardized uniforms for each class detailed in this handbook. Session students, once a month dance students, Kinderboogie students and January-June students have no required classroom attire with the exception of shoes and that they must be present in athletic, “dance like” attire. Hair in general must be neatly fastened back, secure, and of the face for all dance classes. Ballet buns are required for all RAD Examination ballet classes. WILL MY CHILD PERFORM IN A SHOW? All Recreational, Pre Competitive, Competitive and Accelerated Choreography classes participate in our annual year end showcase in mid June. There are two separate year end showcases and students are divided by what makes most sense schedule wise. Students may perform once or twice pending the need based on registration and amount of students participating. Tickets to our year end show case are $20.00 +gst per ticket. Our show currently takes place at Bert Church Theatre. The theatre cannot accommodate strollers or baby buggies and each person attending the show must have a ticketed seat. Due to fire regulations, children may not sit on laps. During Recital Week students will be required to participate in a Dress Rehearsal for their show as well as their show. The Dress Rehearsal is important as this is when we practice changing of costumes, technical cues, volunteer positions and the basic facilitation of the show. This helps our actual show run much smoother. Parents are not permitted to watch Dress Rehearsals but are encouraged to help and volunteer during recital week where they may be needed. A detailed “Recital Newsletter” is emailed out to all parents as well as handed out in carbon copy and posted on our studio window and bulletin boards. These shows happen every June and it is important that parents keep informed of what is going on and how they can successfully participate. Students registered in Session Classes or Kinderboogie do not participate in the year end showcase, however, do have a parent watching week at the end of their session or season. Students at the studio receive recommendations at the end of the season giving them options for classes they may take. As we are a competitive studio, it is our intention to have all students eventually involved in one of the streams of our competitive programs although we still run a structured, technical and fun recreational program for all ages. We run several different options for competitive dance based on commitment, scheduling, technical ability, examination levels and experience. All students should be able to compete in dance and have a competitive experience. Students pay a coaching fee in January that covers the cost of having their designated teachers present for competition. SBDC Staff Members are responsible for putting group numbers on stage, prepping students in practice areas, meeting with competition directors and staff, and maintaining order with students at competition. Staff Members are not responsible for practicing our Solo Team athletes, however, may do so if there is sufficient time in between groups. Though our staff is very helpful, we encourage parents to communicate with one another at competitions and not with the staff on matters of costumes, facility, schedule, hair and makeup. These things are distractions for our staff from the tasks they are hired by the studio Director to complete. We have an annual competitive parents meeting after Christmas where parents can meet with the teachers and Studio Director who go over matters of competition etiquette, hair and makeup, the awards process and any other matters concerning competition. Parents are responsible to purchase their own program at competition or share programs with other parents. The studio does email out a copy of the schedule but often the competition runs ahead of schedule. Students are to be ready to compete 90 minutes prior to their scheduled competition time. This means they should be at the facility ready to practice with their hair and makeup complete and their costume on. Being unorganized not only affects one student but their entire team. Members of the Solo Team are required to warm themselves up and may be required to put themselves on stage. It is imperative that these students track when they are supposed to be onstage and remember their music for competition. Competition groups are our staff members first priority at competition. Stage rehearsals are arranged for all students involved in competitive dance groups. Attendance to these rehearsals is mandatory as they are the final chance for choreography adjustments before competition. These rehearsals take the place in lieu of one regular scheduled class at the studio. These rehearsals take place at Bert Church Theatre, however, pending the need, may be booked at different venues. The initial cost for stage rehearsals is $20.00+gst/student/group for Pre Competitive Dancers and $25.00+gst/student/group for Competitive Dancers. Students may or may not be asked to wear their costumes for these rehearsals. It is at the discretion of the choreographer of the piece. HOW DOES HAIR AND MAKEUP WORK? Detailed Hair and Makeup sheets will be emailed to parents for each class at the studio that participates in recital or competition. Parents are responsible for making sure they are “in the know” on hair and makeup for classes. Most commonly the hair and makeup are simple, however, for feature routines, musical theatre or productions, the requirements may be complex. Parents are responsible for the cost of makeup and/or anything that need to use for hair. Hair requirements may change for competition or recital based on scheduling, however, we pride ourselves on being able to do quick changes and make sure our students “look the part” for their routines. Competitive students wear our studio earrings with their costume. These can be purchased from the SBDC Office for $20.00+gst. If deemed necessary, the studio may host a hair and makeup class where parents can come in and learn how to do our studio basic makeup and hair styles properly. We also generally post “how to” pictures on our Facebook page at “Kendra Sbdc”. HOW DO WE JOIN THE SOLO TEAM? The solo team consists of any routines choreographed outside of classroom hours and can include solos/duos/trios or small groups which must be requested by the parent and then approved by the staff. Students on our solo team are considered to be elite for their level and age group and have more responsibility at competition than normal group students. Solo Team request emails are due to the studio office by mid October. Students will be informed of accepted or proposed routines by the start of November and choreography will begin in December. Some SBDC Staff members with heavy choreography loads for the season may deem it necessary to start solo team routines earlier. The cost for a routine on the solo team is anywhere between $600-$800 including choreography and competition entry fees and includes extra rehearsals outside of classroom hours. After initial choreography, students on this team are expected to practice on their own on a regular basis and/or set up private lesson times within the studio. The choreographers are not responsible for setting extra practice times for students outside of their initial choreography lessons. Students on the solo team are expected to warm themselves up and rehearse at competition on their own, with other students, or with a parent. They must have their music on hand at competition and may be required to put themselves on stage. Instructors that are available at competition may choose to assist soloists in preparing, however, are not required to. These are meant to be our independent dancers. They are responsible to track when they are meant to compete and meet their instructor backstage. Students are chosen for these routines based on their technique, artistic ability, ability to pick up choreography quickly, past history with the studio and level of responsibility. Solo Team members are responsible for their own practice and thus responsible for their outcome on stage for the season. Group routines are first and foremost our main focus as a studio. Being a member of the Solo Team is a privilege. Costume ideas will be prepared by the choreographer for these numbers. It is the parents responsibility to make arrangements to outfit their child while still maintaining the standard of SBDC. This can mean reusing a costume, purchasing a costume or having one made. We do encourage students within our studio, especially first time Solo Team members to reuse or buy second hand costumes for their routines. A copy of the music will be provided once to Solo Team members via email. SBDC has a zero tolerance policy for bullying or mistreatment of any kind within the studio or when representing the studio in a public forum. This includes parents as well as students in person or via email towards other SBDC parents, students, teachers, employees or public venues. This is inclusive of SBDC matters only. SBDC will not discipline or withdraw a student based on hearsay and is not responsible for parenting of our young dancers. The studio is not responsible and cannot control the actions of every person outside of studio hours and events. In the case there is a disagreement amongst parents or students, parents are asked to handle the situation on their own and outside of the studio. SBDC will be only get involved in matters that directly affect the reputation and standard of the studio, preparation of our students, or safety of our facility and its patrons. SBDC employees work for the Director of the studio and not for parents. Teachers, Class Helpers, Assistants, Seamstresses and Office Employees are to be treated with respect and consideration at all times. Please do not approach our employees with your personal matters not pertaining to dance. Appointments can be set up with any of the above to discuss dance matters at any time simply by emailing admin@stardancecompany.com. SBDC staff members do not meet with parents alone and more than one staff member will always be present during meetings. We ask that parents and students remember that dance is supposed to be a safe place for children to come and feel good about themselves. Every student progresses at their own pace and every student will achieve their own personal level of accomplishment. Berating another child or your own for what they do or do not achieve can be detrimental in the long run. We as a staff have to recommend students based on their abilities, however, all programs of dance at our studio, regardless of the level, are educational, artistic, fun and teach life skills.